I'm sure everyone knows what a corn dolly should look like - something similar to the picture at the top, right? It being Lammas, or the festival of the grain harvest, I thought I'd have a go at making one. It is quite traditional to make corn dollies at this time of year. However, I soon discovered that corn craft isn't as easy as it looks. 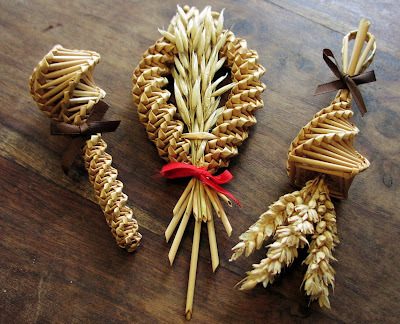 Corn dollies, sometimes called corn mothers, have been made out of straw as part of harvest customs all over Europe for centuries. According to folk legends, the spirit of the corn lives among the crop, but is made homeless by the harvest. 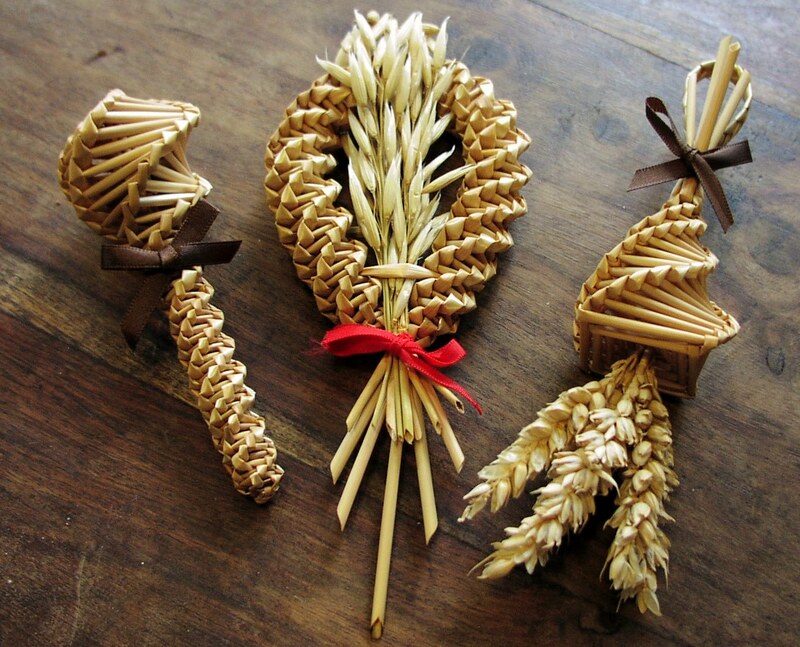 James Frazer said in The Golden Bough that it was often the very last sheaf of the harvest that was made into a corn dolly. The dolly would have a hollow enclosure within in for the corn spirit to live in during the winter. In the spring, the corn dolly was ploughed into the first furrow of the field, to return the spirit to the land. Last summer I found four stalks of wild grain growing in my garden when I was doing some weeding. I carefully cut them and placed them on my altar at harvest time. I wanted to make a corn dolly, but didn't know how so they remained in a vase on my alter until a few days ago. With Lammas coming round again, I decided to finally learn how to make a corn dolly. With a bit of web browsing, I learnt that you need at least five grain stalks to make real corn dollies. There are rather good instructions here: http://auntieannesextremelyusefulstuff.blogspot.co.uk/2011/01/how-to-make-corn-dolly.html. Looking a bit further, on the Eden Project website I found instructions to make a simple corn dolly called a four-straw plait: http://www.edenproject.com/blog/index.php/2011/09/how-to-make-a-corn-dolly/. The four straw plait is also sometimes called a countryman's favour. Rather than being a home for the corn spirit, a favour was something a harvest worker might make as a gift for their sweetheart. How romantic. However, I am really not very talented at following instructions for making things, it seems. Despite reading the instructions over and over, I couldn't seem to plait my four straws correctly. Using that techniques, I made the corn loop you can see to the right. It doesn't really look like the pretty plait on the Eden Project website, but nevertheless I am a little proud that I managed to make anything at all. At least it is more of a success than my biscuits that turned into purple splodges last year. My corn dolly has pride of place on my altar this Lammas time. Maybe next spring I will return it to my garden when I turn the soil ready to plant some seeds. It's not as bad as it looks you know. For a first attempt it's very good! I trim the stray ends off mine with sharp scissors to give a neat edge. And if you put a ribbon round the join it'll improve no end. The Eden Project left out the actual instructions for the Compass Plait, making it not too easy for people to figure out.